Huge pillow and very nicely fluffed. I love the pattern and it goes well with almost any décor. Very pleased with the size for the price. Happy with purchase. Bring uplifting detail to your home with this 22-inch cotton pillow. 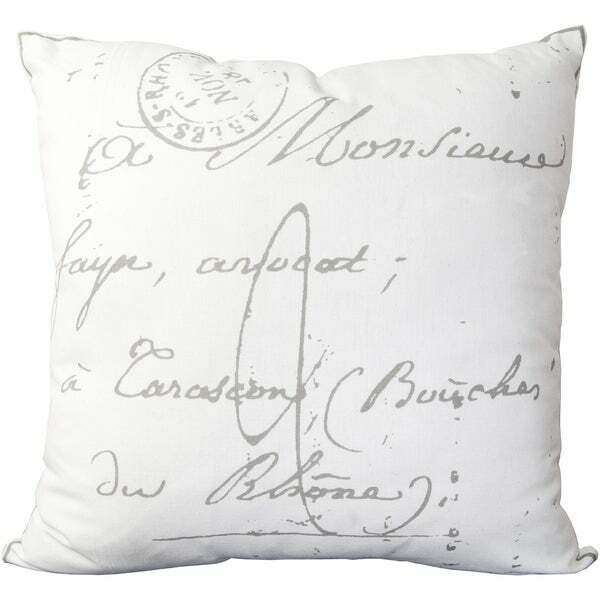 Shocasing a creative french provisional design, this accent pillow will make a spirited addition to any space. I love the print and material of these pillows - my only issue is that the down insert does not have enough fill to maintain the pillow's form. It causes the pillow to look saggy. I ordered the beige polly-filled pillow and it's perfect. Exactly as pictured. These pillows look exactly like the photos I replaced my original couch cushions with these and I love them ! Adds just the right amount of brightness to my dark gray couches ! I loved the look of it online but the fabric lacks lustre, I wouldn't put it on display in my living room. "there are two options, one that ends in d and one in p. Which one is the white background with the tan writing?" Hello Heather L., the P stands for polyester, the D stands for down. The white is the lighter color and beige is the darker color, we currently only have the white in stock. Thanks for shopping with us!